Unrequited love might have ignited the American Revolution. Never before has this story about George Washington been told. 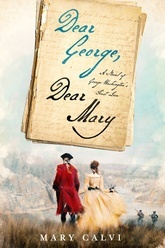 Crafted from hundreds of letters, witness accounts, and journal entries, Dear George, Dear Mary explores George’s relationship with his first love, New York heiress Mary Philipse, the richest belle in Colonial America. From elegant 18th-century society to bloody battlefields, the novel creates breathtaking scenes and riveting characters. Dramatic portraits of the two main characters unveil a Washington on the precipice of greatness with his insecurities and his inspirations, using the very words he had spoken and written, and his ravishing love, whose outward beauty and refinement disguise madness.